Sage, also known as Salvia officinalis, is a universal herb that can treat many ailments ranging from skin disorders to digestive issues. Sage is very easy to grow and you can have your own supply year round. Sage, also known as Salvia officinalis, is a universal herb that can treat many ailments ranging from skin disorders to digestive issues. Sage has antiseptic, astringent, antispasmodic, and antihydrotic qualities. It is an efficient herb for infections or ulcerations of the mouth, skin, or digestive tract. Due to its significant antimicrobial constituents, it is also effective against many bacteria like E. coli and Salmonella. In addition, it is very effective against fungal infections and does a reasonable job at taking care of ringworm without the need for other interventions. Sage is best used as a tea or tincture. You can use sage tea as a compress or the leaves themselves as a poultice directly on skin infections. Another one of my favorite ways to use sage is with a tea infusion for any mouth infections such as ulcers, gingivitis, or sore throats. Sage is very easy to grow and you can have your own supply year round. It is best to harvest the sage leaves for use just before the flowers appear. 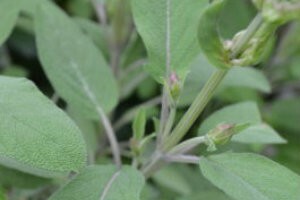 Sage should be used with caution with pets that are epileptic.